When designing a deadly, challenging B is for Beast or N is for Nemesis, it is often helpful for the Galaxy Master to begin by envisioning what extreme Characteristics their creation should have. These types of superlative enemies should always have an array of talents, tricks, weapons, and defenses that present a challenge to the players that have broken the rules, gone beyond the envelope of “fairness”. Most importantly, these additions make this creature into something totally awesome. 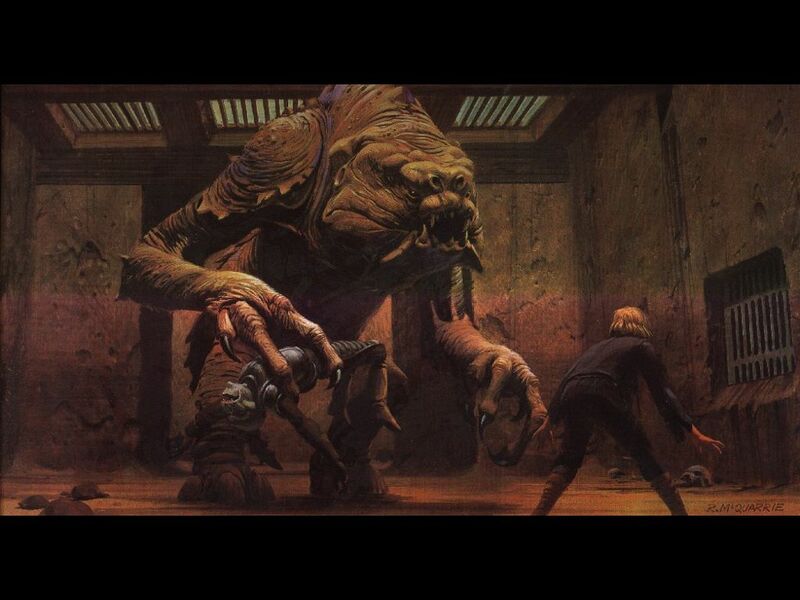 The techniques described in this post are in large part an extension of the design of the major enemies in Fane of the Sith Lords, such as The Emperor, Mara Jade, and the Four-headed Hyper-evolved Dianoga. In addition, every frustrating enemy must always have one or two Characteristics at a lowly 1. Your creature should have an unfair advantage, a true challenge to be overcome, but also a distinct weakness that can be exploited by clever and persistent players. The fun in using these horrorific creations is not in punishing the other players or reveling in your own ability to “win”; satisfaction is instead found in seeing the players pull out a glorious victory in the face of certain doom. At this stage, a Galaxy Master should also begin imagining the fiction that informs and supports the Characteristics. What makes your creature’s abilities so extreme? Is it cybernetic, Sith-touched, genetically modified, from another universe, incredibly ancient, or something else? Lastly, make sure to enforce your narrative with real bite by applying concrete, definable new abilities and weaknesses to reflect your creature’s Characteristics. An enemy with Willpower 7 is just one that rolls a lot of dice, but a foe that can drain the life force of living creatures is an opponent that will never be forgotten. An array of special abilities and weaknesses has been provided below to help inspire your own designs. It is recommended that a truly frightful enemy be provided with a minimum of 3 such abilities. At the beginning of this year, I launched an ambitious FFG Star Wars campaign, pulling mostly from the then-new Age of Rebellion Beta, titled Crush the Rebellion. An overview of the core assumptions, house rules, and scattered campaign notes have already been posted HERE on Triumph & Despair. I encourage readers who wish to probe for additional information on something specific to post Comments below; it is very hard to see from our perspective where we are vague and what details outside observers find interesting or lacking in detail. The campaign had a rare, though certainly not unique, concept of the players acting as Imperial Agents sent out by The Emperor Himself to stop the most heinous crimes against the Empire. The player characters are set at a level on par with such legends as Darth Vader, Mara Jade, and Grand Admiral Thrawn. The Agents have bonus starting XP and unlimited funding; but are limited in terms of Restricted items, item modifications, and vehicles. The story of the campaign follows a seemingly natural theme of The Empire; corruption, a bloated beurocracy, traitors, and various threats from within are the true villains. Every Agent has a Secret Agenda that they pursue and must balance advancing that agenda, thwarting the rival Agents’ agendas, and keeping their activities hidden; all while still completing the incredibly dangerous tasks assigned to them. It is one thing to conquer the galaxy, it is a much harder thing to rule it. It’s dangerous at the top. The most daunting task for me, as Galaxy Master, was to appropriately handle the innate player-vs-player dynamic that goes with this sort of campaign. This is something that many have found to be troublesome and problematic, experience showing the pitfalls, frustrations, and hurt feelings of such an endeavor. However, I felt very strongly that this was absolutely essential to the kind of story I wanted to tell; the story of the fall of Galactic civilization, the problems inherent in humanity’s empires, and how our own unchecked ambitions and hubris are the cause. Not only that, but in all humility, my track record has shown (HERE and HERE) that I am uniquely qualified in the endeavor of successful PvP roleplaying games. In other words, I am the shiiiiittttt. Following the campaign’s conclusion, I conducted an in-depth discussion about both the faults and advances of the campaign; what made it good, where did it fail, and how we can use this information to craft better, more fun gaming in our futures. Listed below is a brief description of the Agents and a long, detailed discussion of the campaign via 12 questions I have asked and the players and their long-winded answers to them. Per request, here is a short summary of the characters involved in my CRUSH the REBELLION campaign and a few words describing each of our 9 sessions. Where applicable, links have been provided to longer discussions on individual Operations. As always, general feedback and specific questions of interest are appreciated. Later in the week, I won’t let you just take my word at it and will provide a comprehensive interview with the players to get their view on the campaign as experienced. Secret Agenda: Assassinate The Emperor (succeeded). Secret Agenda: Construct a superweapon that would enable a new droid revolution to conquer the galaxy. Secret Agenda: Grand Moff, build an unspecified superweapon. Secret Agenda: Orchestrate a massive military defection to the Rebellion. Secret Agenda: Hunt down and slay a hidden Jedi Master. Secret Agenda: Oversee the genocide of all Ewoks. Operation I – A convoy of five Imperial transports must be protected from an anticipated ambush by Rebel military forces. Imperial Intelligence has determined that a lost Jedi outcast is among the terrorists. The Jedi must be captured and interrogated to learn further information about Rebellion military activities in this sector. Surprise: The Jedi Knight is a non-gendered, weird alien composed of a slippery mass of tentacles. Operation II – A geneticist located at an isolated research outpost has been selling Imperial secrets to the highest bidder. Prove which of the scientists is the traitor and bring him or her to justice while quelling uprisings from the local populace. Surprise: The only way to route out the true traitor is to solve a complicated Zebra Logic Puzzle. Operation III – Local organized crime on an outer rim world has been supplying outlawed, dangerous medicines to a plague-ridden populace as well as explosives to nearby terrorist cells and must be stopped. 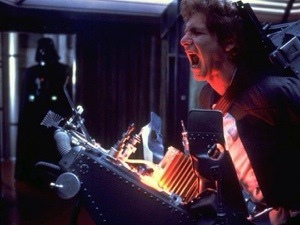 Surprise: The Rebel Leader from Operation II returns angry and cybernetically enhanced. Operation IV – The captain of the IEF Tydeus has succumbed to the unclean influences of a heretical cult located in the unknown regions. Find a way to board the renegade Imperial vessel and relieve its Captain Kitano of his command before the ship escapes and makes the jump to lightspeed. Surpise: This adventure is a speed run of Only Two Ways Home, giving the players only about half the time that they really need to complete it. Players must use their metagaming knowledge of previous runs of the adventure to win. Operation V – A shapeshifting alien has infiltrated the ranks of a local planetary government cabinet and the senate hall is on lock-down. Kill the shapeshifter and save as many cabinet members as possible. Everyone trapped inside is either vitally important to Imperial operations or is a noted public figure. Surprise: The shapeshifter is a liqui-metal droids and there are, in fact, two of them. 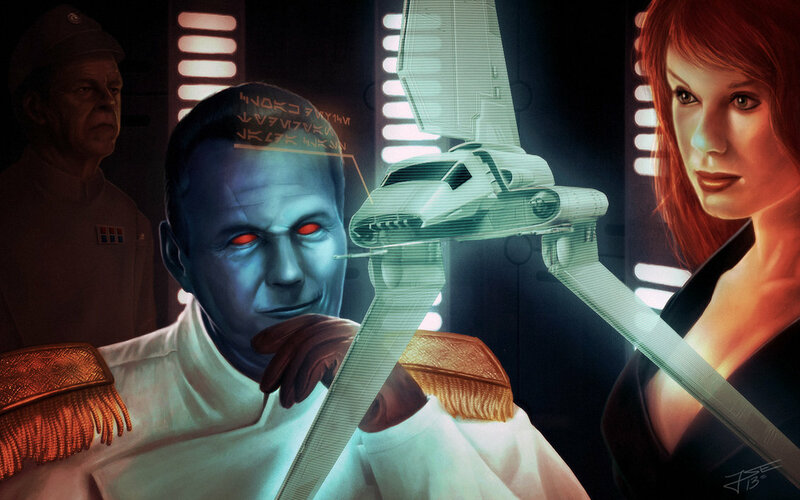 Operation VI – With a Victory-class Star Destroyer at your command, watch over the development of the new TIE Phantom stealth fighter and goad any traitors into action so that they can be caught red-handed and in the act. Surprise: The commander of the VSD is Zebb’s nemesis and does everything in his power to make this Operation difficult for the Agents. Operation VII – Preside over negotiations on behalf of The Empire at the Kimanan star system, whose people have taken the local Imperial Moff as hostage and who are now led by a Jedi fugitive. Surprise: The Agents’ covert, pirate transport captain has sold them out. Operation VIII – Following your previous Operation’s failure, the Kimanan star system has gone into revolt and joined the Rebel Alliance, taking with it the military defenses supplied to the planet through The Empire and protected by the Pirate Queen Kath Scarlet. Command an Imperial-class Star Destroyer and support fleet to invade the system and punish the Kimanans for their treachery. Surprise: The Kimanans have a Cloning Facility and Mitichlorian Infusion Center that will soon produce a clone army of artificially-empowered Jedi. Operation IX – Hunt down the fleeing architects of the Kimanan revolt. Kill the Pirate Queen Kath Scarlet at the pod racing contest of Tattoine. Capture the Jedi Knight MacKenzie hiding in a lost Jedi ruin and bring him before The Emperor Himself. Surprise: It’s a Trap! designed by The Emperor to kill the scheming Agents and put a stop to their Secret Agendas. One of the most well-received posts on Triumph & Despair has been the invaluable Revised Stat Block Format. 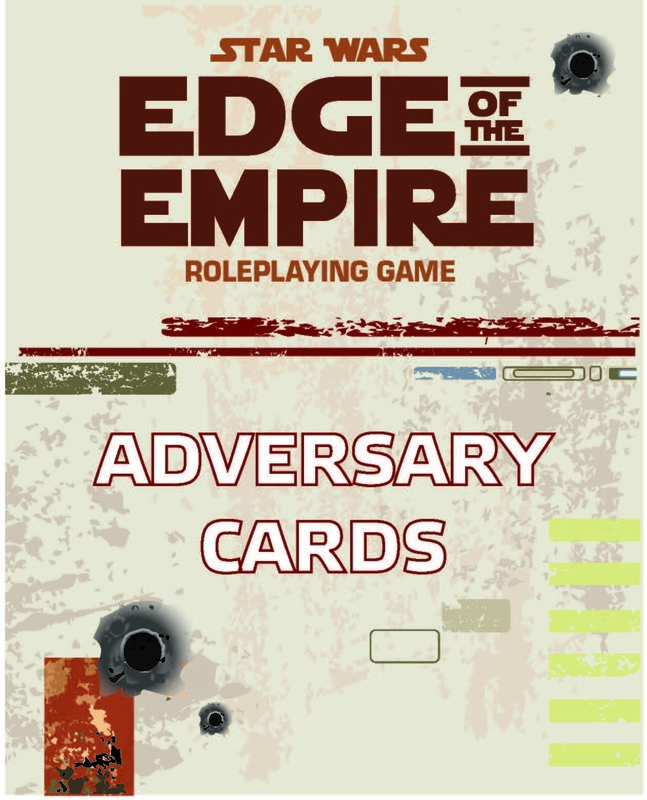 It takes its cues from other roleplaying games designed for maximum legibility and utility at the gaming table, expertly presenting the overwhelming wealth of information in the stat blocks for Edge of the Empire and Age of Rebellion in a way to lead a panicked Galaxy Master seamlessly and intuitively through a combat encounter. It also is a necessary component in running adventures in the SpaceCore style; utilizing the streamlined format to allow the Galaxy Master to focus on provided a fast, furious experience of maximum intensity. Galaxy Master Eric Carltock has taken this idea to the next level, applying his artistry to the revised stat block format to create something wholly new. He has graciously allowed his work to be posted here and I could not be more thrilled. Behold! This set of 64 painstakingly crafted stat blocks cover the range of enemies presented in the Edge of the Empire roleplaying game. They take the fundamentals of design pioneered here at Triumph & Despair and put a shine to them; creating a stat block with both elegant presentation and an artistic style to match the rest of the Core Rulebook, something to truly replace the cumbersome, unreadable blocks of the past. For my own sake, I plan on giving these great stat blocks a permanent home in my Galaxy Master’s Binder; waiting in the wings for the times when I need to pull out a quick NPC, unprepared and on the fly while running a game. Operations provide the guiding framework for Imperial-centric adventures in Star Wars roleplaying games. By using a matrix of randomized tables, a catalyst for creativity is created for the Galaxy Master to grow forth a unique, engaging, and fun adventure for his or her game. This article distills the essence of what it means to be an elite operative of the Emperor and enhances all of the challenges that they must surely face while at the same time accounting for the rightful advantages the backing of the Galactic Empire confers upon its Agents. Though they serve the same basic function, Operations and H is for Heists differ in several key ways. Heists function in a campaign focused on greed and lawlessness. The main drive in an Edge of the Empire campaign is the acquisition of more and more wealth (see EotE Core Rulebook, Keeping The Players Hungry), through an infinite variety of creative means. In stark contrast, a Crush the Rebellion campaign is instead focused on just the opposite; using unlimited wealth to keep peace and order in a galaxy teeming with chaos and an infinite variety of threats. In a few weeks I’ll be starting up a brand new FFG Star Wars campaign. Determined to make something great out of Age of Rebellion, I have crafted together the framework for a campaign dubbed Crush the Rebellion, as described three moths ago here. The core element of this campaign is the idea of a Secret Agenda – a major project overseen by the Agent and hidden from the Emperor for various reasons. 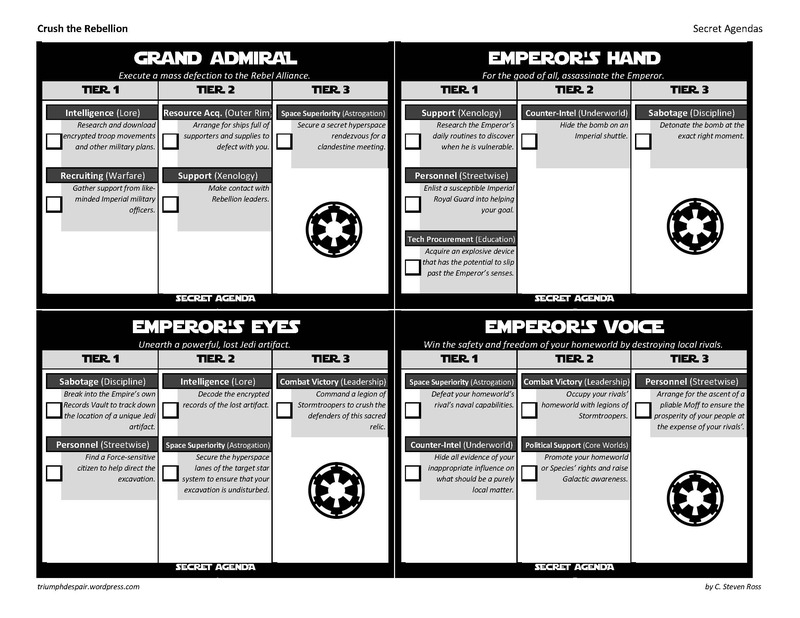 Secret Agendas replace Obligation and Duty and offer no mechanical effect other than the first player to fulfill all 5 steps of their character’s secret agenda wins the game by changing the face of the Galactic Empire forever. As we progress and actually play out my theoretical ideas about this game, I’ll be posting small updates to my treatises and house rules to better reflect what we’ve learned. Already, I’ve tweaked the original Secret Agenda post to include contingencies for Destiny Points and revised the reward system. The first of these are Secret Agenda Cards (PDF). These simple handouts are designed to clearly show how agendas operate, how the actions dovetail into a compelling narrative, as a practical means of keeping track of one’s secret agenda, and as a handy reference guide when trying to divine the secret agenda of rival Agents. 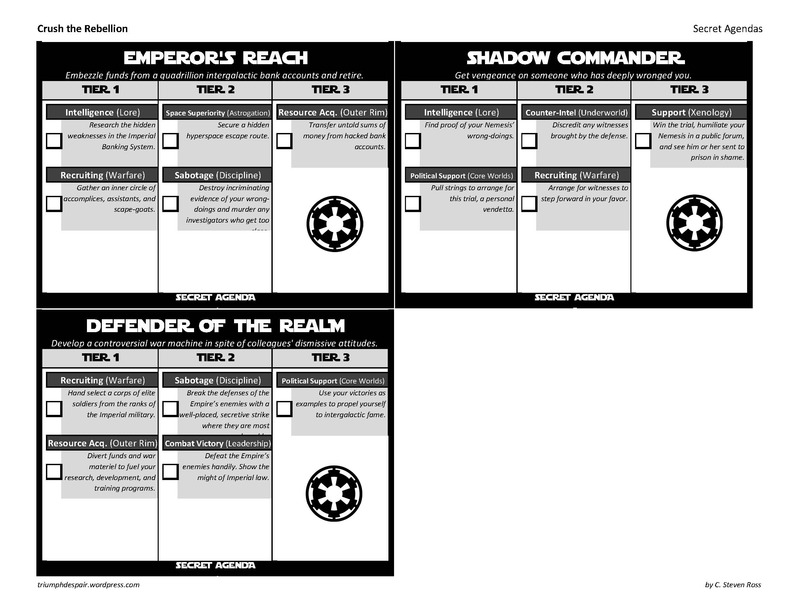 When reading the Age of Rebellion Beta, it became immediately obvious to me that the little-used Edge of the Empire skill Leadership was intended to be a focus point and oft-used mechanic in this new campaign setting. Many Careers and Specializations offer Leadership as a Career skill, and many different talents offer added Boost and removed Setback to the skill. I find, however, that the basic skill descriptions offer too little in the way of guidance on how to actually use this skill in a meaningful way at the game table. That is to say, there have been no examples shown that provide a satisfying call for a Leadership check. I want something to really sink my teeth into, something that makes spending XP on Leadership an enticing but still difficult choice. 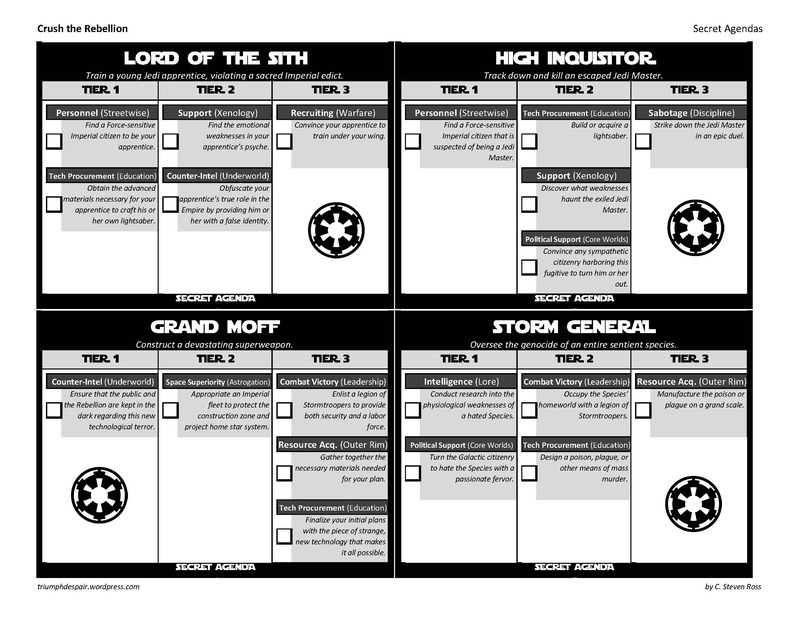 The author(s) of the canned adventure for Age of Rebellion, called Operation: Shell Game, seem to recognize this issue by including a handful of called-out Leadership checks. However, their example shows Leadership as a social interaction skill akin to the Charm skill, but limited to impressing military personnel, ranking officers, etc. This has left me wanting, and only now has a satisfying alternate House Rule came to me.